TMR observes global chlamydia infection diagnostics and therapeutics market is fairly consolidated due to presence of strong players. The top five players operating the diagnostics accounts for the larger share of nearly equal to 58% while players operating in the therapeutics accounts for nearly 24%. There are numerous companies are operating in the market, however, some of the companies are experiencing fierce competition among them. Some of the key players operating in the global chlamydia infection diagnostics and therapeutics market are Novartis AG, Bio Rad laboratories, F Hoffmann-La Roche, Danaher, Abbott Laboratories, bioMerieux, Siemens AG, Thermo Fisher Scientific, DiaSorin SpA, and Becton Dickinson and Company. In order to be a part of competition, these companies are increasingly focusing on the new product launch, expansion of business across regions, and improving product portfolio. For this, they are adopting the strategies including the acquisitions, mergers, and collaborations. 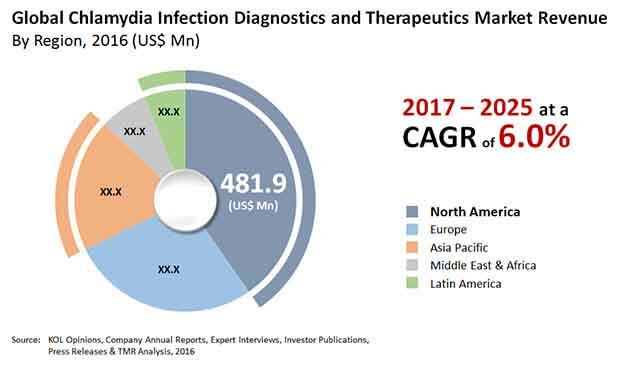 The global revenue of the chlamydia infection diagnostics and therapeutics market registered at a US$1,195.5 mn in 2016 and is estimated to rise at a CAGR of 6.0% over the forecast period from 2017 to 2025 to attain value of US$2,002.2 mn in 2025. On the basis of diagnostics methods, the market is the segment of nucleic acid amplification tests (NAAT) accounted for the larger share with more than 69.8% in 2016. These tests are approved by FDA and their demand for these sensitive diagnostic tests is fuelled by the rising prevalence of chlamydia. On the basis of region, North America accounted for the larger share of more than 55.5% in 2016. Prevalence of chlamydia infection, sexually transmitted diseases (STDs) and numerous other infections are increasing which is boosting need for the novel diagnostics and therapeutics especially in the developed countries is driving demand for infection diagnostics and propelling growth of the global chlamydia infection diagnosis and therapeutics market. Growing number of research and development activities mainly for the academic research is driving growth of the global chlamydia infection diagnosis and therapeutics market. In addition, rising health awareness coupled with rising healthcare expenditure globally have boosted the demand for chlamydia infection diagnosis and therapeutics. Risk of infection among young generation due to numerous biological factors is fuelling demand for the infection diagnostics which is likely to drive growth of the global chlamydia infection diagnostics and therapeutics market. Availability of sensitive and effective diagnostic tests is leading to surge in the number of cases of these infection. However, social shame related to screening of Chlamydia trachomatis which causes Chlamydia is promoting bullying and ostracism, which has discouraged young generation mainly from age group of 16 to 25 who are sexually active to undergo voluntary screening. This factor is restraining growth of the global chlamydia infection diagnostics and therapeutics market. Nevertheless, the factors such as prevalence of co-morbidity factors in women coupled with advancements in the screenings have boosted demand for the infection therapeutics and diagnostics.